Energy: The shale oil “miracle” was a stunt enabled by supernaturally low interest rates, i.e. Federal Reserve policy. Even The New York Times said so yesterday (The Next Financial Crisis Lurks Underground). For all that, the shale oil producers still couldn’t make money at it. If interest rates go up, the industry will choke on the debt it has already accumulated and lose access to new loans. If the Fed reverses its current course — say, to rescue the stock and bond markets — then the shale oil industry has perhaps three more years before it collapses on a geological basis, maybe less. After that, we’re out of tricks. It will affect everything. Government over-reach: the leviathan state is too large, too reckless, and too corrupt. Insolvency will eventually reduce its scope and scale. Most immediately, the giant matrix of domestic spying agencies has turned on American citizens. It will resist at all costs being dismantled or even reined in. One task at hand is to prosecute the people in the Department of Justice and the FBI who ran illegal political operations in and around the 2016 election. These are agencies which use their considerable power to destroy the lives of individual citizens. Their officers must answer to grand juries. This entry was posted in Amerca, Economy, Energy and tagged american economy on September 3, 2018 by Bone Fish. The peak in credit and lending is behind us. Banks have sharply pulled back on lending and have been tightening lending standards. Banks are saying they see less demand so why are people saying demand is strong? We live in a credit driven economy. Most know this to be the case. Individuals and corporations borrow money from banks for homes, cars, real estate projects and other investments. The availability for credit is perhaps the most important driver of economic growth, aside from income growth. Without credit, the economy grinds to a halt. It is not a surprise that banks have a desire to lend money when times are good and pull back lending when times are tough. This seems logical but when times are tough for consumers is exactly when they need credit to push forward with new marginal consumption. Much of my research lately has been outlining the peak in the economic cycle that occurred in 2015. Many people misconstrue this for an imminent recession call or a stock market crash prediction when that simply is not the case. The economy follows a sine curve. It peaks and troughs and for the most part follows a nice cyclical wave. Recessions occur when growth is negative but the “peak” of the cycle occurs well before the recession. They are not simultaneous events. The most important point to understand is the elapsed time between the peak and the recession, where we live today. Many confuse the “peak” of the cycle with the end of the cycle when in fact, across all economic cycles, the peak occurred about ~2 years prior to the recession. After the peak of the cycle is in, growth does continue, albeit at a slower pace. It is a dangerous assumption to make when critics of this analysis say we are still growing when we are growing at an ever slowing pace. When growth goes from 3% to -2%, let’s say, it has to hit 2%, 1%, 0%, etc. in the middle. That deceleration is what occurs between the peak and the recession. There is a large population of investors and analysts that simply look at the nominal growth rate and say 2% is still okay, without regarding that the growth has gone from 3% to 2.5% to 2% and now lower. The time to prepare for the end of the economic cycle is after the peak in the cycle has been established. The good news, like I said before, is you typically have two years after the peak to prepare yourself. Preparing yourself does not mean buying canned foods and building a bunker as many raging bulls like to straw-man even the smallest critics into a “doom and gloom” scenario. Preparing yourself in my view involves reducing equity exposure, raising cash, and increasing defensive exposure. The good news is that you can still ride the gains of the lasting bull market with an asset allocation that is slightly more defensive. You may slightly under perform the last year or two of the bull market but if offered a scenario in which you gained 3% instead of 10% in the last year of the bull market and then gained another 3% instead of -10% in the following year, I would hope you’d pick the pair of 3% because that in fact leaves you with more money. In a raging bull market some cannot stomach “leaving” that 7% (these are clearly arbitrary numbers used to make a point) on the table. For the rest of the piece, I will use the banking loan growth and the banking surveys to prove the peak of the credit cycle is in and we are in a period of decelerating growth, falling down the back of the sine wave as I pointed out above. The recession is in sight despite how hard many want to avoid it. I will also at the end run through the portfolio I began to recommend on May 1st that will prepare you for slowing growth but also allows you to share in the upside should the market continue higher. So far, that portfolio is actually outperforming the S&P 500 with a negative correlation and lower volatility. I will go through this at the end. For the analysis of the credit peak, I will use two main economic reports. First is the “Assets and Liabilities of Commercial Banks” published by the Board of Governors of the Federal Reserve and the second is the Senior Loan Officer Survey also published by the Board of Governors of the Federal Reserve. The “Assets and Liabilities” report is a weekly aggregate balance sheet for all commercial banks in the United States. The release also breaks down several banking groups. The most interesting part of the report is the breakdown of loan group in which you can see auto loans, real estate loans, consumer loans and much more. Most importantly, this is hard data and not subject to sentiment, feeling or bias. Banks are either growing their loan books at a faster pace or a slower pace. This is perhaps one of the biggest economic signals. Banks would experience lower demand or credit issues and tighten up their loan books before that lack of credit leaks into the economy in the form of lower growth. The following data from the Assets and Liabilities report will indicate just how much banks have reeled in their lending and prove the peak in credit growth is long gone. This is exactly as it sounds; all loans banks make, the broadest measure of credit availability. This is an aggregation of all the loans made by all the commercial banks in the survey. Currently this report aggregates 875 domestically chartered banks and foreign related institutions. Rarely do I look at any data series in nominal terms, not year over year that is, but this chart does show the peaks in total credit fairly clearly. Credit rises week after week without ever slowing down. The only times when there was a pause, drop, or large deceleration in credit creation was during times of economic distress. Banks are fairly smart and they won’t lend if risk is too high, uncertainty is too great or credit quality is too low. Many will speculate on the reason for a drop off in bank lending but the reason truthfully isn’t that important. The growth rate in total credit shows you exactly when the fat lady began to sing on loan growth. The question is not whether credit growth has peaked, that is clear. Credit growth is also never negative without a recession and we are getting dangerously close to that. If the prevailing sentiment is that demand is high, why are banks pulling back lending at a record pace? The rate of the drop in credit growth has been accelerating. Some may point to the current administration and the uncertainty surrounding policy changes but I would push back and say that growth peaked and was falling since 2015, far before this political scenario. It is very critical to look at the above loan growth chart in the context of the sine curve at the beginning of this piece. If negative growth is a sign of recession, I think you’d be crazy not to shift defensive. Don’t sell all stocks, just know where you are in the cycle. This is the broadest measure of all credit, so what is the specific sector that is causing the aggregate loan growth to plummet. The context of the cycle is clear in the above chart so for all the specific loan sectors going forward I will focus on this cycle only from 2009 through today. The report is also on a weekly basis. If a data series does not start from 2009 or prior, that is because that is all the data available as some series began in 2014.
Credit growth in the real estate sector peaked later than overall credit but has certainly registered its highest growth of the cycle. Real estate clearly does well in times of credit expansion and less so during times of credit growth contraction. Mapping home price growth from the Case-Shiller Home Price Index over real estate loan growth should highlight the importance of credit growth for real estate and the dangers of disregarding its rollover. Not surprisingly, there is a high correlation between real estate loan growth and home price growth. 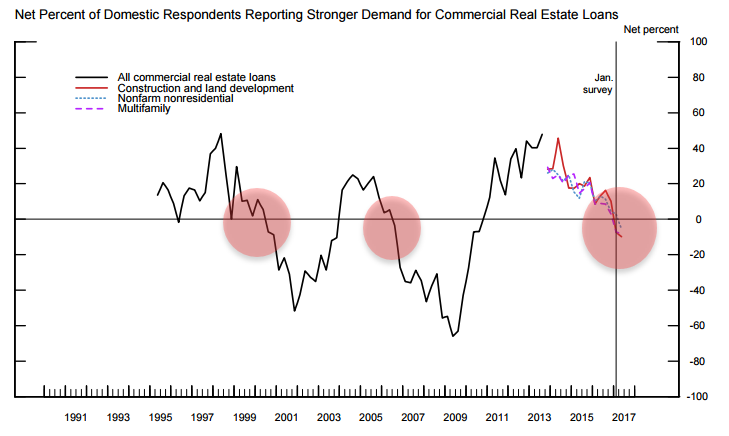 Just briefly skipping ahead (will return to this) the Senior Loan officer survey also shows that banks are claiming lower demand for real estate loans; mortgages and more specifically, commercial real estate. 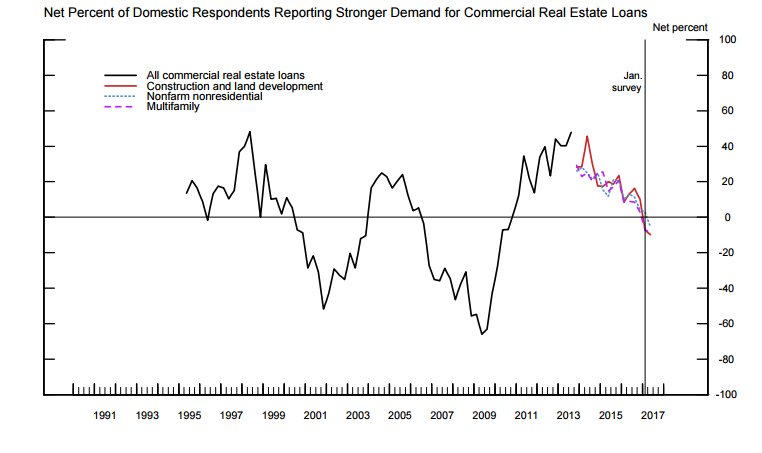 It is hard to overstate the importance of this, specifically the commercial real estate demand. People claim “demand is booming” or something of the sort but banks, the ones who actually make the loans, are claiming demand for real estate loans is the weakest since just before the last housing crisis. Again, not making that call but this drop in loan growth and demand is telling a far different story than those who claim demand is through the roof. Consumer loan growth in the credit card space are following trend with the rest of loan growth, still growing but decelerating and months past peak. With credit card growth rolling over, in order to keep up with the same consumption, consumers need to spend their income. The problem is income growth is falling as well. Total real aggregate income is near its lowest level of the cycle. With loan growth slowing and income growth slowing, where is the marginal consumption going to come from? With this data in hand, it should not some as a surprise that GDP growth has gone from 2% to 1% and sub 1% as of the latest Q1 reading. What are banks saying about consumer demand? Across all categories banks are reporting weaker demand. Again, where is the strong demand that everyone keeps talking about? 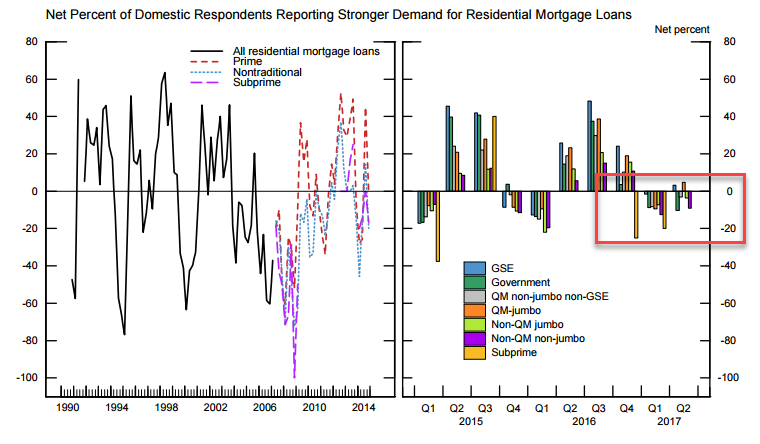 It is not showing up in loan growth data or in banking demand surveys. I will reiterate this point continually; loans are still growing and income is still growing but at a slower pace and past peak pace. This should put into context where we are in the broader economic cycle. Unfortunately, the auto loan data started in 2015 so there is no previous cycle to use for comparison. Nevertheless, the peak in auto loan growth occurred in the summer of 2016, and like other credit, has been declining to its lowest level of the cycle. Not much more needs to be discussed on auto loans that is not widely covered in the media. Subprime auto loans and sky-high inventories are a massive issue. In fact, auto inventories are the highest they’ve been since the Great Recession. The goal here is not to predict a subprime auto loan issue but rather to point out yet another area of growth that is slowing to its lowest level of the cycle. 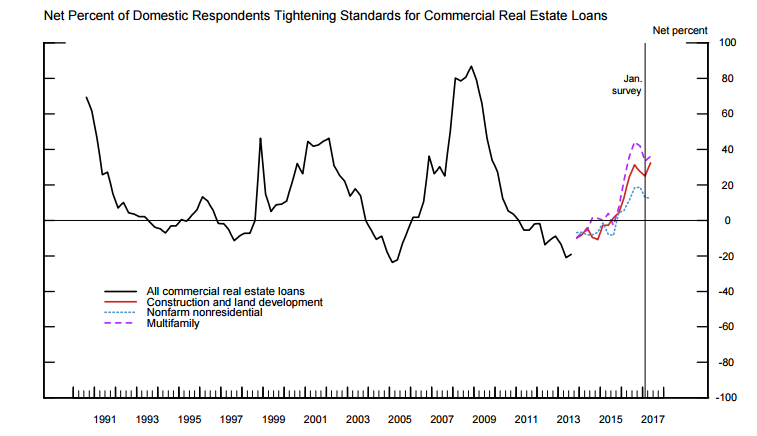 While the peak in commercial real estate loan growth is in as well, the peak occurred later than the aggregate index. CRE loan growth topped out in 2016 while the aggregate loan growth peaked closer to the beginning of 2015. As I pointed out above, banks are sending a serious warning sign on the commercial real estate market. The senior loan survey shows a triple threat of warning signs from the banks. They are claiming falling demand, tighter lending standards and uncertainty about future prices. A warning from the banks. The fat lady has been singing on credit growth…So what do you do? On May 1st, I put out a recommended portfolio that the average investor can follow. The portfolio is a take on Ray Dalio’s All Weather portfolio. I strongly believe peak growth is behind us, and when that happens, growth decelerates until the eventual recession. I am not in the game of predicting the exact date of the next recession. I do not want to be long the market or short the market per se. The best way to phrase my positioning is I want to be long growth slowing. (All analysis on this portfolio is from the time of recommendation, May 1st, to the time of this writing on May 18). I use SCHD in my analysis as I mentioned I would choose this over SPY for additional safety but either one is fine. Since the recommendation, the portfolio is up an excess of 0.96% above the S&P 500 with under 2/3 the volatility and a negative correlation. The weighted beta of this portfolio, given the asset allocations above, is 0.02. This portfolio is nearly exactly market neutral and has a yield of around 2.5%, above the S&P 500. This portfolio protects you in all scenarios. If the stock market continues to rise, your portfolio should rise just slightly and you should continue to clip a nice coupon. Should the market fall, the bond allocation will provide safety and stability to the portfolio. A portfolio like this allows you to weather the bumpy ride, stay invested, and continue to clip a dividend yield. Of course, this is not an exact science and past performance is no indication of future results. Also, those who chose to follow a defensive, yet still net long, portfolio such as the one above can replace SPY or SCHD with their favorite basket of stocks. The reason I chose the ETF was for simplicity. The percentages above are what I feel are best for the current environment we are in. It will allow me to share partially in the upside while mitigating my downside. At the end of the day, the most important thing is to protect capital. If you want more equity beta, reduce TLT exposure and raise SPY exposure (or your favorite stocks). This portfolio is the best way in my opinion to not be long, not be short, but be neutral and long growth slowing. I will continue to update this portfolio and rotate asset allocation as the economic data changes and my positioning becomes more bullish or bearish. Disclosure:I/we have no positions in any stocks mentioned, but may initiate a long position in TLT, GLD, IEF over the next 72 hours. This entry was posted in Banking, Economy, Housing Market, Real Estate and tagged american economy, peak of the cycle, real estate market cycle, stock market peak on May 19, 2017 by Bone Fish.